Successful route finding and navigation in canyon country, especially in Grand Canyon, requires knowledge of the rock layers. 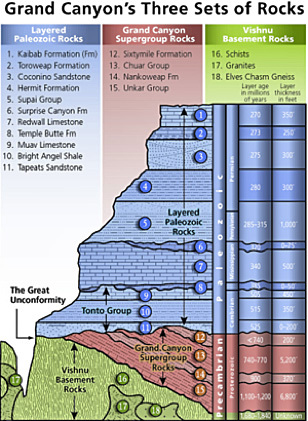 Many guide books frequently refer to specific rock layers when describing a route. And a knowledge of the characteristics of specific rock layers is extremely useful when exploring for new routes on your own. The layers are grouped into 3 structural categories: Slope, Ledge, and Cliff. Slope usually means easy route finding, Cliff usually means trouble, and Ledge often means shelter. 1. Kaibab Limestone. Cliff. Grayish white. 2. Toroweap Limestone. Cliff and Slope. Grayish white. 3. Coconino Sandstone. Cliff. Creamy white. 4. Hermit Shale. Slope. Deep red. 5. Supai Group. Cliff, Ledge, and Slope. Deep red. 7. Redwall Limestone. Cliff. Gray, stained red. 9. Muav Limestone. Cliff and Ledge. Gray with yellow. 10. Bright Angel Shale. Slope. Blue green. 11. Tapeats Sandstone. Cliff and Ledge. Dark brown. 16. Vishnu Schist. Black with mica. Ledge and Slope. "Know The Canyon's History. Study Rocks Made By Time." Many trails and routes follow benches. The three most prominent ones include the Esplanade (located on top of the Supai formation), the Tonto Platform (located on top of the Tapeats), and the bench that often appears on top of the Redwall.